So, we’ve had a poem from a man waiting to enter his battle: Rupert Brooke writing on the troopship carrying him overseas; and poems written from first-hand views in the trenches by Siegfried Sassoon, Wilfred Owen, and T. E. Hulme. We’ve had reactions to the war and its losses from Ezra Pound, Tristan Tzara and Carl Sandburg. William Butler Yeats, even in refusal, is writing a war poem of a sort, one I suspect has a hidden barb at the politicians’ war propaganda. For the most part, the poems I’ve used so far would not pass as journalism. Owen and Sassoon use fantasy to illustrate the war’s folly. Pound, Tzara, and Sandburg tell of the subjective emotional impact of the war’s losses. But Brooke’s fragment has the power of a closely observed diary entry, and T. E. Hulme comes closest so far to a straightforward war dispatch with his compressed account of the front at St. Eloi. Today’s piece, using words by F. S. Flint, comes closer yet. Flint, the man who urged the “School of Images” in pre-war London to hew to a cadenced free verse, felt that verse and prose existed on a smooth and unbroken continuum, that good writing was good writing, regardless of the label on the tin. Besides being present at the birth of Modernist English poetry, Flint also was in the right place to witness another Modernist invention: aerial bombardment of cities. It’s little remembered now, but nighttime terror bombing of London was not an invention of Hitler’s air force in WWII—it was, instead, first carried out by Zeppelin airships in World War I.
Flint’s report, though artfully framed with its first-person account of being awakened from sleep in medias res, and ending with a surprising and telling conclusion, includes enough exact detail to say that it describes the first of these London raids on May 31st, 1915. It’s a gripping account, no less than if it had been filed this year in Syria or somewhere else were bombs fall on civilians in our time. Does the element in Flint’s work of mere journalism detract from its “poetic” qualities? The romantic element would say yes perhaps, there is no other “realer, now revealed” world invoked, no intense yoking of disparate images or modes of perception (although I would maintain it does just that in a subtler way). More elaborate language, more elaborate metaphors could decorate this. Picasso’s “Guernica” is the same subject, painted decades later, but it’s also more worked out as a cubist statement. In a sense this question is like a question I wrestle with here as I contemplate the Parlando Project which combines music with words. Does the addition of a substantial thing to something else: in the case of Flint’s “Zeppelins,” documentary, journalistic facts to modernist poetic imagism; or in the case of my Parlando Project pieces, music and performance’s addition to what is often canonical page-poetry—are those things additive, making a greater sum—or do they, paradoxically, detract, diffusing or de-fusing the impact of the uncombined thing. Or are these questions of art a sideline here? Do Henry and Caroline Good, dead of flames and smoke in their bedroom in that night in 1915, or Leah Lehrman, age 16 killed by a Zeppelin-dropped bomb explosion care? Do we appreciate that we live now and ponder these questions? 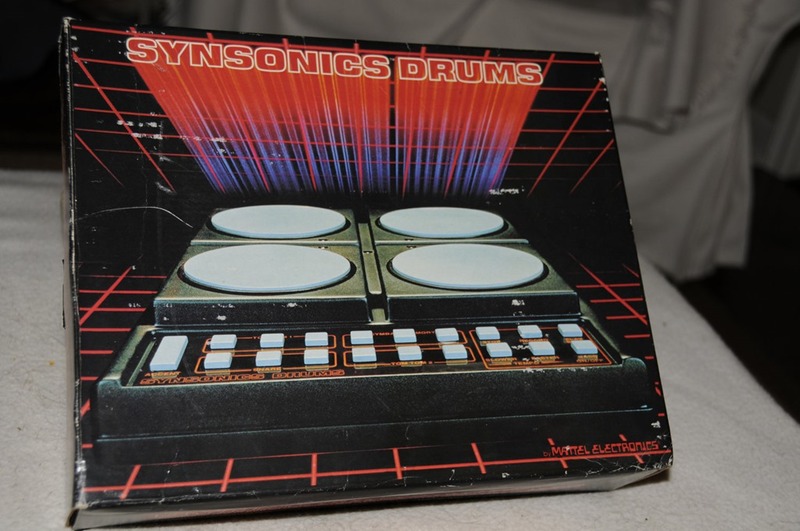 Later that same 20th century, my first drum machine. In writing and performing the music for Flint’s “Zeppelins,” I wanted to lean toward Techno a bit. I avoid drum machines these days and work hard to humanize my beats on most pieces. Back in the 20th Century I used machine beats, they were all I could afford, and now in the 21st, no matter how skillfully deployed, they remind me of those crudely resolved sounds, a make-do. My 12 year old son however enjoys them, the blippiest tracker pieces or a SID chip 8-bit beats please him with their antique charm. Then listening to Weekes new single this weekend reminded me of that charm (and made me wish I could sing better). So I gave it a go. You hear my performance of F. S. Flint’s “Zeppelins” right here with the embedded player below. Something about those later 20th Century sounds just seemed right for an early 20th Century piece to me. Really enjoyed this one! Ugh, yes, my processed drums are probably my biggest struggle in recording everything singlehandedly and on a budget (of £0)… but I’m happy if they manage to come across with 20th century charm! Interesting questions you pose above. In my opinion, artistic efforts such as yours are additive and ‘making a greater sum’. Because you are keeping art alive, changing, adding, and celebrating. Poetry, music, art doesn’t (and can’t!) exist in a vacuum, and it’s our duty as artists of the NOW to expand on artists of the THEN. I suspect we’re close in recording budgets (grin). And all the Weekes stuff I can hear on Spotify sounds great to me.One thing that cannot be approximated or appropriated from a machine are those lovely vocals on those songs. No need to apologize for processed or drum machine sounds these days. My current production/writing schedule reduces my time to listen to other current music, but when I listen to modern rap/hip hop productions, particularly those with unusual or introspective lyrics, I’m struck by the use not only of sampled loops and motifs, but the continued use of old-school drum machines or low bit-rate samples. I smile to myself, hearing the very things that I have tried to leave behind are now, to at least some music makers and listeners, a sign of being cutting edge and referencing indie vitality. I get to hear a little EDM sometimes too, and when I listen to random things that are called to my attention, I’m struck by the freedom to use very rough edged and degraded digital sounds there. Within my personal “mix tape” persona with the Parlando Project stuff I want to embrace and use those ideas too. Listening to “Dance Violent” and my son’s ideas of what sounds cool reminded me that I need to get on with that. Looking forward to more Weekes music with that album release. Well, that makes me feel better, thank you! Singing is my passion, so the vocals are the most important aspects for me in my music/the most enjoyable bits to record. I do love electronic music, though, and it has been fun playing around with options this past year (after previously always performing with other musicians). I do wish I had access to a fancier platform, though, like Apogee. Thanks so much for listening–means a lot to me! HOLY SH*T!! This is the stuff of which bad dreams are made.